Cuba; the big trip is just weeks away! Finally, finally I am starting to get a handle on planning it. This is no ordinary vacation, no package holiday and no tour guide. This is us on two wheels, panniers packed and adventure in our hearts. Booking the flights some time ago seems to have hindered preparations rather than helped them. Sometimes the longer you have to do something the slower you do it. I need to be under pressure before I get organised. Well, now I am under pressure. A few years, whilst travelling in Vietnam and India I met various people who had been on cycling trips to Cuba. They all raved about it. A seed was sown and Cuba went onto my list of places to visit. All the people I met had been there on organised cycling trips, very much like the ones I was on in Asia. Then, in 2015, my sister and sister in law went on a self guided cycle tour and their experience seemed even richer. Instead of heading to Havana, as many people do, they travelled to southern Cuba. Their long days on the bike, over tough climbs but with stunning views, looked magical. We decided to follow in their tyre tracks. When we decided on the trip I had no idea that I would be chosen as part of the Pearl Izumi Champion Team for 2017. It seems even more fitting to be undertaking such an amazing trip now I know this great news! Flights to Cuba are not too expensive, so long as you book early, so that’s what we did. A seat each and a booking for two bikes. Much of the accommodation is chosen as you move each day. We will mainly be using Casas Particulares, private homestays, which are a little like an Air BnB equivalent. Relatively inexpensive and a fantastic way to get a taste of real Cuban family life. Lunch on the road will be bought from roadside sellers, apparently a slice of pizza is a common snack and I’m not going to argue with that! We will certainly have to carry plenty of water each da. It’s going to be hot out there on the road and villages may be few and far between some days. I can’t wait for those days when we are cycling by the ocean and can stop off for a cooling dip! There is much planning still to be done but the one thing. we do have is our route. We are using Bicycling Cuba, a book by Wally and Barbara Smith for much of our advice. Written following their extensive cycle tours around the country in 2000/2001, the book has some great detail. More information can also be found on their website. 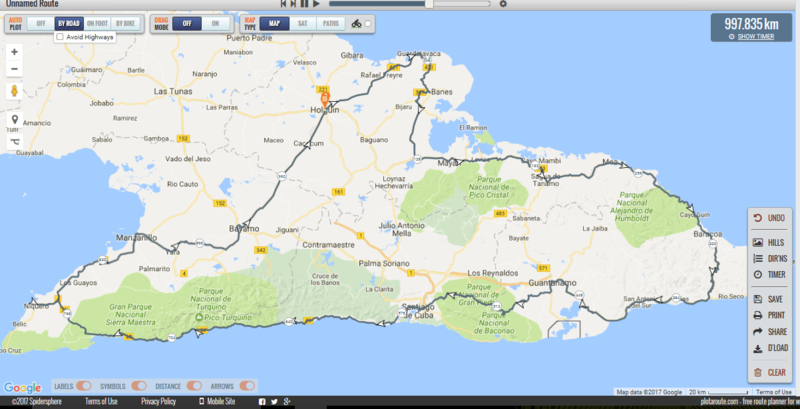 We have chosen to start by following their 561km Far East Tour, starting at Holguin and making our way around to Santiago de Cuba. The second half of our trip takes in part of their South Coast Loop, travelling further along the coast before heading inland to Bayamo and back up to Holguin. It is looking as if we will cover around 1000kms in the 22 days we are in the country. Luckily this means we will have time for five or six days out of the saddle! As much as you get to see a wonderful amount of a country by cycling it is also important to me to spend time off the bike. This is both to explore further and to relax. We have some ideas on this, a few towns where we will be spending an extra night etc. But if anyone has visited the area and has any tips I would love to hear them.